Regular gutter cleaning is a crucial part of regular home maintenance in Toronto and surrounding Areas. We offer a full suite of gutter maintenance services for all types of gutters. Combined with a thoroughly gutter cleaning, we increase the lifespan of an existing eavestrough systems by optimizing drain outlets to full capacity, re-attaching loose gutters, replacing damaged sections, reconnecting loose pipes and resloping gutters that don’t drain correctly. Our gutter cleaning and maintenance service includes eavestrough Cleaning. All organic debris extracted from the gutters into our leaf paper recycling bags and left on site to be taken and despised. We test the downspouts to be clear, we make sure that your property is cleaned if we make a mess. Leaky seams and corner sealing, end cap and lap joint repairs. larger drains and leaf traps. Leaf Guards and Gutter guards installation. Gutter Realignment to correct poor drainage. Do your Gutters Appear to be Rusting? We understand that pure aluminum does not rust, but this does not mean homeowners are not susceptible to deterioration of their aluminum gutters. Even new aluminum gutters can often come from an impure combination of aluminum and trace amounts of other metals such as nickel, lead, or steel. If your gutters appear to be rusting, the aluminum is deteriorating due to a reaction to these other metals or is an indication of an impure aluminum product. This process is called galvanic corrosion or anodization. Gutterfix only uses quality North American aluminum of the highest purity that will not rust or suffer from galvanic corrosion. 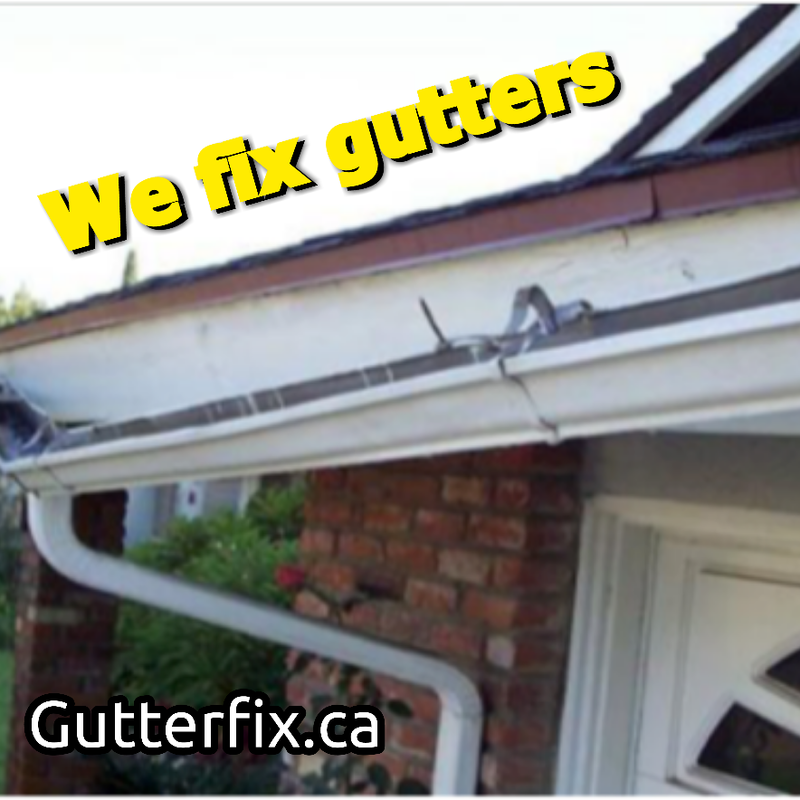 Gutterfix is proud to bring you comprehensive gutter cleaning service in Uptown Toronto for keeping a neat property and for your building to function effectively. We believe having clean gutter is essential for keeping a neat property and for your building to function effectively. When you contact us for Gutter cleaning service you can be assured that the entire eaves system will be cleaned meticulously by professionals. Our team will ensure all the corners and joints are properly sealed and that there is no such leakage. We will clean the gutters carefully and check for any clogging or leaks. We advise having gutters cleaned and cleared once a year to avoid a buildup of moss, leaves and general debris which causes blockages and overflowing water. No matter what size or number of floors it is, we will clean all gutters and offer a 100% satisfaction guarantee on all jobs. Install new drain locations including new downspouts and leaf traps if needed. Repair or replace fascia, sub-fascia, and interior structural elements as needed.